There are economic opportunities in the growing secondary wood products market—biofuels, bark, sawdust, pallets, wood chips, briquettes—and commercial harvesting done in ways the forest can support. There are also economic opportunities in the expanding new natural resource economy that includes things like work related to erosion control, fencing aspen stands and doing other restoration activities. There are also hurdles that make it hard for local companies to win such contracts. We engaged the University of Oregon to gather timber project data from 2006-2015 and get input from local contractors on regional forestry projects. Here are some of the findings. Between 2006-2015, the U.S. Forest Service awarded $3.8 million in timber sales to purchasers. 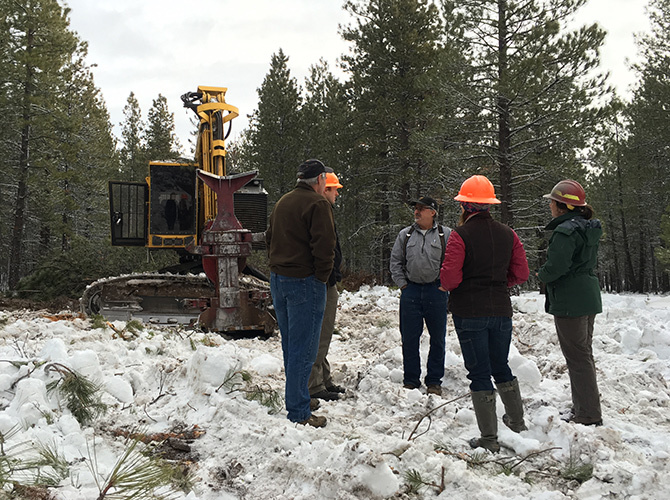 USFS restoration contracts totaled $10.3 million on the Ochoco National Forest, just over $1 million per year on average. 40% of restoration work was awarded to contractors in Deschutes, Crook, Grant, Jefferson or Wheeler Counties. Tree thinning accounted for half of restoration spending on regional forestry projects. We know more needs to be done to make sure the jobs and revenue for restoration contracts, secondary timber products and timber sales on the Ochoco National Forest are kept local. The Collaborative is helping figure out how to take down these barriers. The Collaborative is taking the following steps to help local businesses compete for and win forest management contracts in the Ochocos. Work with the U.S. Forest Service to award more contracts in sizes that match local business capacity (ranging from a few thousand dollars to $100,000), to better sustain local restoration and forestry workforces. Making subcontracting easier, so local businesses can bring in expertise or equipment they lack in-house, or handle overflow work. Timber-related jobs are changing as the industry continues to evolve and active restoration projects grow. Here are the ways people are finding work in the woods in the region today.